What was the last really good book you read that had vampires in it? Do you remember? I have to admit, ever since the urban fantasy and PNR genre has grown so much and offers a vast variety of creatures, I tend to read books that concentrate on something other than vamps. There is one series about vampires that I will always love and brace yourselves, it´s not the Black Dagger Brotherhood. 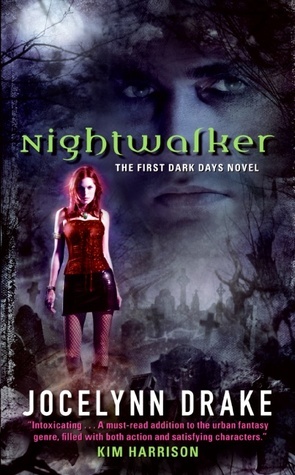 I´m daring you to read Nightwalker by Jocelynn Drake. Nightwalker is the first book in the Dark Days series and it tells the story of Mira, a 600 year old vampire with the rare ability to start and manipulate fire and Danaus, a vampire hunter. Mira lives in Savannah, a city she rules with a strict yet caring hand. When a mysterious vampire hunter comes into town, she decides to meet him. Danaus is not in town to kill the legendary fire starter but to ask for her help in the fight against an old enemy that threatens humans, vampires and weres alike: the Naturi and the Bori. Both races were considered defeated and locked away, but there are signs that they are trying to come back with a vengeance. Mira has fought against the Naruri before and has been kidnapped and horribly tortured in the process, so the fight against them is personal for them. Mira and Danaus are both very fascinating, complex characters. Mira’s encounter with the Naturi has left her emotionally scarred and her ability to manipulate the element that can be deadly for vampires makes her very unique even in her world. Danaus is even more of a mystery. He looks human, but Mira senses that there is more to him. He has been taught that all vampires are basically evil, yet, he’s quite fascinated by Mira, even though he tries to deny it for a long (long, long =) ) time. And let me tell you, the attraction is very much mutual. The Dark Days series is an urban fantasy series, so the romantic element in the first few books is very subtle. That doesn't change the fact that after the second or third book, the sexual tension between the main protagonists is enough so set your book on fire. I was basically screaming at them to finally do the deed. On the other hand, I was actually glad that Jocelynn Drake didn’t rush things between the two of them. It allows Mira and Danaus to become really close and trust each other, even though they still keep promising to kill each other. There’s also so much to learn about their pasts and secrets and it´s great to see how they grow. The secondary characters are just as deftly written as the leading couple. Jabari and Valerio, some of the vampires Mira is closest too are incredibly complex and deftly written. Even some of the bad guys turn out to be characters I would have wanted to read more about. Each book is a thrilling read full of action, fights and suspense and there is never a dull moment. The battle against the Naturi is one of the major storylines and comes to an end in the final book, Burn The Night. Aside from the Naturi storyline, the books are also full of vampire politics, which is a battlefield of its very own. Mira, being one of the power players in the vampire world because of her ability has to tread very carefully. A lot of vampires want to use her for her power and even more try to get rid of her for the same reasons. Jocelynn Drake admittedly doesn’t reinvent the wheel when it comes to her vampires and their abilities. She totally makes up for that with the intricacy of the description of the races of the Naturi and Bori. She is also not afraid to pull any punches. There are many shocking deaths and twists that had me hold my breath. I can wholeheartedly recommend this series to everyone who doesn’t like vampires sparkly and books thrilling, gripping and uncompromising. For centuries Mira has been a nightwalker—an unstoppable enforcer for a mysterious organization that manipulates earth-shaking events from the darkest shadows. But elemental mastery over fire sets her apart from others of her night-prowling breed . . . and may be all that prevents her doom. The foe she now faces is human: the vampire hunter called Danaus, who has already destroyed so many undead. For Mira, the time has come to hunt . . . or be hunted. The book is only 1,19$ on amazon, so don’t miss the opportunity! - You choose a book you’ve read, loved and would dare your readers to read! - The book you choose must be an older release (at least 6 months ago), because let’s be honest, we’re all quite aware of the latest releases. - Write your own blog post, using the button and linking back to Tynga’s Reviews, inviting your readers to read your chosen book. - Come back on Tynga’s Reviews and put your link in the linking tool. - Browse other bloggers Dare and let them know if you’ve read their featured book, or plan on reading it. - Super easy and an awesome way to discover that special book who might have slipped off your radar! Don’t forget to add your own Daring You To Read… post in the linky below. Wow, this sounds good. I will put it on my wishlist as I am not sure if I already have those books or not. Thank you for the recommendation. Whoo-hoo! I hope everyone who jumps into Nightwalker loves the book. I loved writing the Dark Days series. Mira and Danaus offered such fun and adventure! What's more, if you fall in love with Mira, I've got one last story coming out for her. On April 10, Bound To Me will release to e-readers. It's a prequel story that looks into her early relationship with Valerio and it is HOT. Enjoy!